I am currently having a Korean food craving. Since I have quite a bit of homemade kimchi and homemade tofu sitting in the fridge, it's best I do something with them. 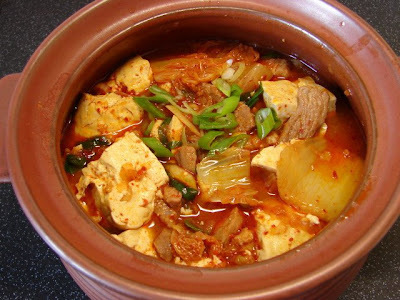 The obvious recipe is kimchi chigae or jjigae, which is a spicy soupy stew with kimchi, tofu, meat or seafood. Very easy recipe just put everything together and simmer in stock or water. For the kimchi best use old kimchi which has a more complex flavour which gives a better flavour to the stew. This chigae I used pork slices, other meat is also ok including sliced pork belly, sliced beef, minced pork or beef, shellfish. I guess if you are vegetarian you can use vegetables and mushrooms like button mushroom, enoki, oyster mushroom, shitake etc. Marinate a handful of sliced lean pork of belly about 150g with some light soy, sesame oil and some sugar for a while. Brown the meat in a claypot or stove top casserole pot with a little oil. Add in lots of tofu, I used about 400g. Then add 1.5 cup of kimchi with the juice. Then add enough stock to cover all the ingredients, usually dashi stock or korean anchovy stock, can also use any stock you got incl. vegetable stock. If no stock just use water. Stir and simmer for a while then taste if spicy enough if not add some Korean hot pepper paste (Kochujang), which is a very thick and red spicy paste. Then add some Korean or Japanese soy if not salty enough. Continue simmering till all the ingredients are bubbly hot and meat is tender. Finally add a dash of sesame oil and chopped spring onion. One piping hot stew ready to enjoy with plain rice. ** If you use sliced beef and seafood add this at the end of the cooking, don't overcook it.